We’re into the final hours of the Steam Summer Sale. It’s been a hell of a ride, for us, for our wallets, and hopefully, for you. Here’s our pick of today’s deals. And remember: the Steam Sale survival guide still applies. SH: I’m a huge Splinter Cell: Conviction apologist. I was a Double Agent apologist too, but in hindsight I was totally wrong about that game. Conviction on the other hand is raw Jack Bauer gun-fodder, with whipcrack executions and brutally technical gunfights. Sure, it’s another few steps away from classic stealth, but it’s a natural feeling series evolution, and it feels damn cool. 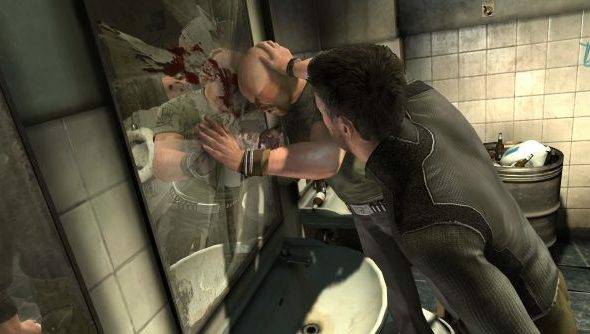 TE: I did enjoy Splinter Cell: Conviction, but I couldn’t help but feel a bit sorry for the guards. They are blind, deaf and stupid. It comes to something when a highly trained assassin misses out on spotting Sam because he’s partially hidden by a waist high wall. SH: Lukewarm remake of a classic strategy game that Kalypso really hopes you remember. For ten pence more you can still buy the infinitely more charming Frozen Synapse at £7.59, I’d recommend that instead. TE: The star, here, is obviously Psychonauts. It’s kind of a platform adventure game, in which you visit the minds of a twisted bunch of weirdos. Very funny, very imaginative, and no-one bought it. Although given the Steam sales and the ridiculous discounts it always gets, that’s probably changed to everyone owns it. SH: Stacking’s the game I’m most interested in here. In it you play a tiny Russian stacking doll who hops inside different characters to solve puzzles across weird, art deco scenes and 1930s cruise liners. Certain dolls have certain powers, and certain dolls can only be stacked inside certain other dolls. It’s short, but the odd sense of humour and uniquely weird setting leaves you feeling warm, if not overly brain-taxed. Also, one day I’m going to look up the definition of ‘art deco’ to check if I’ve been using it correctly. I suspect I haven’t. TE: I was amazed by how much I enjoyed Bastion. It’s a 2D top down action RPG that’s helped along by a gravel voiced narrator. It’s a fairly standard stuff, but I loved its enthusiasm – it just seemed to be in love with its own world. Really great, and you should buy it. SH: I couldn’t stand the narration when I played this. Everybody told me it was brilliant but it’s just some bloke who pipes up every time I smash a pot. Give it a rest mate, it’s only pots. TE: I have not played this, but I like the name. It is a little bit playground offensive. TE: This whole reboot of Operation Flashpoint was a massive disappointment. They did a lot of things right: the engine did great scenery, the weapon and vehicle models were well put together… but they failed in the level design. The problem, particularly in the latter game, was that they’d try and funnel you down into a specific route with very scripted combat engagements – exactly the opposite of what we’d expect from the Operation Flashpoint games. It makes me so sad: the original Operation Flashpoint was mind boggling. TE: Bioshock 1 is a bona fide genuine 100% classic, and I’ll be amazed if any of our readers don’t already own it. Short story: man builds underground city, takes self-sufficiency to the extreme, goes mad, helped along by glowing worm things that bestow magical powers. Bloody brilliant. Bioshock 2, however, is really interesting. It’s a quick and dirty sequel produced by a splinter studio. It suffers a bit because it’s the not a novelty, and there’s an entirely pointless multiplayer mode attached. But… it’s also very good, with some brilliantly written characters. SH: I ran out of steam with Bioshock 2. It felt like a pointless retread of the first game, a repeated experience in a wide world of potential new experiences. I flew a kite instead of playing it, and ran care-free through a meadow before falling into the grass and tumbling. There, staring up into a vast blue sky I vowed never to waste another second of this precious life. I pretty much did the same thing when Crysis 2 came out. TE: Well, Football Manager 2013 will be out in a few months time, with all the latest teams and ratings, so if you enjoy the foot-to-ball, it might be worth holding on to your cash and waiting. However. FM tends to hold its price very well, so don’t expect any immediate discounts on the new version. This deal, I think, is better suited to the uninitiated gamer; the kind of player who just wants to tinker and see what the fuss is about. A word of warning: you will at least need to understand what football is. If you don’t, you should not buy this. Obvious, perhaps, but I’ve fielded lots of questions from random PC gamers who are just curious as to why this is always in the Steam most played. Answer: it is good, and many people like Football. SH: Orion: Dino Beatdown is a heinous, broken piece of gamepoop, a horde mode shooter versus dinosaurs that, every time I’ve tried to enjoy it, has spunked out every sort of error and server issue imaginable. The underlying shooter itself isn’t anything worth enduring bugs and glitches for. World of Goo you should already own. Hydrophobia is a really interesting fluid-physics based shooter, featuring the sort of watery puzzles you’d hoped would’ve worked their way into something like BioShock. The others I’m not familiar with. If I were you, and I was holding your wallet, I’d pick around this bundle and buy individual games I was interested in. Anything to avoid Orion: Dino Beatdown ending up in your library.